Far too often, warm waste water is discharged into the sewer system, together with all the energy it contains. Units in the AquaCond 44 series recover the majority of this heat energy and transfer it to the fresh water. The combination of recuperator and heat pump means that only approx. 10% of the energy is required that would be needed by a conventional heating system. The heat exchanger cleaning system integrated in this series even allows the units to be used where the waste water is contaminated. Recovering valuable energy – anytime when warm waste water is produced and simultaneously warm fresh water has to be provided, e.g. in the shower areas of swimming pools, hospitals or residential homes, in laundries and in many other industrial processes. The principle of an AquaCond unit is to heat cold clean water to process water temperature in an energy-efficient manner. The heat source used is energy from warm waste water. The transmission of heat takes place through the combination of a recuperative heat exchanger with a heat pump. 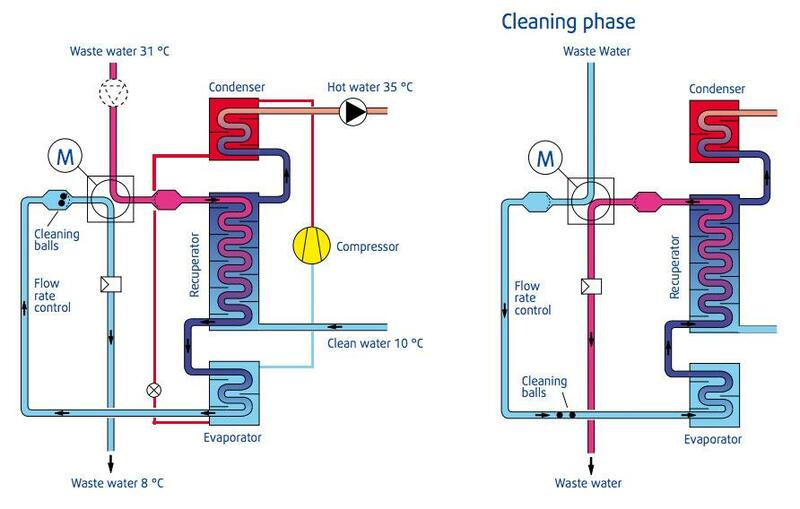 In the first stage, the warm waste water flows through the recuperator and then passes through the evaporator of the heat pump. In counterflow and physically separated, the same volume of fresh water first passes through the recuperator and then through the condenser of the heat pump. In the recuperator, the majority of the heat contained in the waste water is transferred to the cold fresh water. This process takes place by means of the efficient counterflow principle and requires no energy input whatsoever. In the evaporator of the heat pump, a further part of the heat is utilized from the waste water. 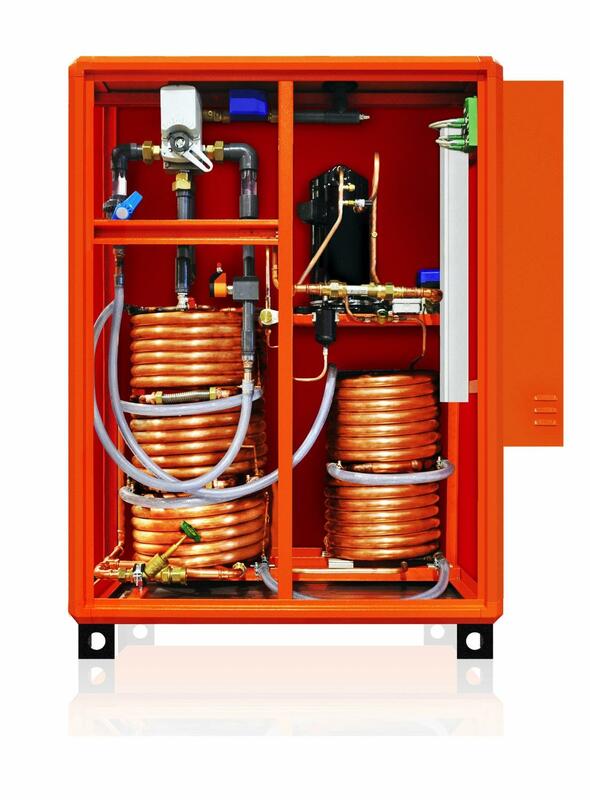 In the condenser of the heat pump it is transferred to the already pre-heated fresh water. Thanks to the optimal design of the individual components, a total efficiency score of 11 is achieved. Uniform pipe cross-sections in the waste water ducts guarantee uniformly high flow velocities. This means that the design reduces deposits of contaminants in the heat exchanger pipes and hence any worsening of the heat exchanger efficiency rating. Despite the uniform flow rates, there is a possibility that soap, grease and other substances dissolved in the warm waste water could be deposited on the exchange surfaces during the cooling phase. If the waste water is organically contaminated, bacteria growth and organic sludge formation will possibly adhere to the surface of the heat exchanger. In order to prevent this, the automatic heat exchanger cleaning system regularly passes cleaning pellets through the waste water ducts. The cleaning pellets loosen the deposits from the pipes and prevent the formation of layers on the surfaces.